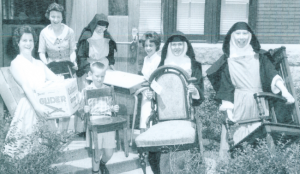 Visitation Academy is the ministry of the Sisters of the Visitation, whose way of life expresses the spirituality of the founders of their Order, St. Francis de Sales and St. Jane de Chantal. These saints encouraged all to “Live Jesus” with optimism, gentleness, humility, joy, and liberty of spirit. “Live Jesus” illustrates the essence of the Visitation charism. The mission of the Academy mirrors Mary’s visitation to Elizabeth: her acceptance of Jesus in her own life and her commitment to carry Him to others. This receiving and sharing of the Lord is the model of the Visitation Academy community. In the fall of 2015, the Sisters moved from Ballas Road to Catherine’s Residence. The Sisters continue to have an active presence in the daily activities at Viz.